This is a large home (2220 sq. ft.) sitting on one acre located in a very quiet neighborhood (Indian Ford Ranch) just five minutes north of Sisters. Also near Camp Sherman, Black Butte Ranch and only half an hour from Bend. A Deck with BBQ, 2 floors, 5 beds, 2 fireplaces and a garage. Great for a co-family vacations! Lots of games. A DVD capable wide screen TV. Coffee and Tea fixings. Kitchen supplies. Please note: THIS IS NOT A PARTY HOUSE. If that is what you are looking for, please go elsewhere. You must be respectful of our neighbors. Especially our closest neighbor. It is a very quiet place. There is little to no late night activity. There is absolutely no walking on neighbors properties, and you must always leash your dog outside. We live in an HOA, and if our guests do not respect the neighborhood standard, we can lose our privilege to rent our home. It is a shame that I have to even mention these things, as our experience with most of our guests has been great, however a couple bad eggs have nearly ruined things for us. We live in Portland. I am an actor/teacher and my wife works with a non-profit. We adopted our two kids from Ethiopia. We hope to move to Sisters during our kids high school years. Ted grew up coming to the family cabin a few minutes walk away, so we were very grateful to get back into Indian Ford, so that our kids could share some of the same memories from Ted's childhood. toilet, shower, Hair Dryer. Soap and Shampoo. Two car garage with plenty of outdoor parking. One upstairs and one downstairs. * There is room to sleep 8 comfortably in the beds provided. However, we have air mattresses available and a cot, as well. There is no sleeping outside. We loved our stay at the cabin. The owners were kind and responsive with any questions. We like this "cabin" very much. We plan to come again next year. We feel much at home. We love the area around -- the mountains, etc. and have spent many vacations backpacking in them. Nice master bedroom bed! Great location, very quiet and spacious. Friendly hosts (over text). The property is located in spectacularly beautiful country of High Cascades. Fun, good food in town, welcoming place to come home to. If we were to stay longer, we would have tidied up the big yard and back porch area. Very comfortable. Would stay again. This house was everything we needed for a weekend getaway--and more. This is a well-kept, comfortable house with all the usual amenities. It is a 10 minute drive into Sisters, Oregon. The only thing I wish was different: all the knives could use a good sharpening. Otherwise, what a terrific place! We enjoyed our stay very much, very accommodating, friendly. Wood fireplace wonderful. Wildlife very interesting as lots of wild turkeys. Hope to go there again next year. My family thoroughly enjoyed our stay at the cabin. Lots of room for a family of 6. The boys loved the trampoline and the adults loved all the wildlife--wild turkeys and deer. 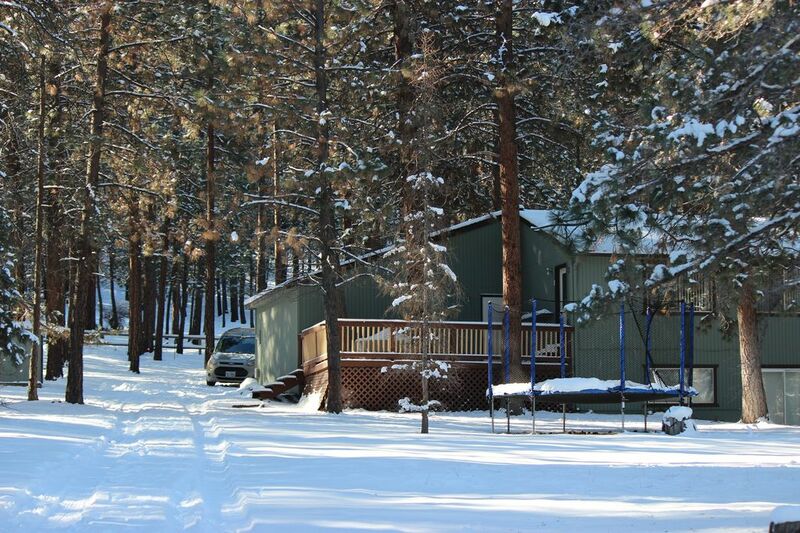 This house on a quiet street is on a spacious one-acre lot 5 minutes north of Sisters and is a wonderful retreat from busy life for 1 to 8 people who would like to experience the spectacular beauty of Central Oregon with all the comforts of home. **On flat rate stays, there is still an extra charge for more than 4 people of 15 dollars per night per person. **If the place is left extra messy and requires extra cleaning time, the cost will be taken out of the deposit. **For "Event" bookings for travelers of more than 4, there will be a per person rate of $15 per night added. **If not staying all of the nights of "special events", there is leeway for negotiating a fair discount.